I come here for one thing, and that is, I have visions of other worlds. I have visions that’s unimaginable. I have visions that I can’t even tell people. And I try, the best thing I can, to draw my visions. For those of you who are not familiar with outsider art, it is a label created by French artist Jean Dubuffet to describe art created outside the boundaries of official culture. I first became interested in it through my “Great-Uncle Shorty” who lived in Zahl, North Dakota. He assembled the craziest sculptures created from found objects. 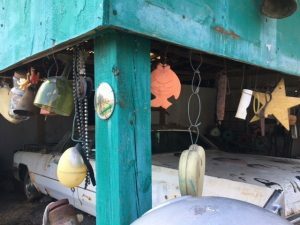 These sculptures included animal horns, tractor seats, kewpie dolls, discarded pot and pans and other assorted objects. They were created on the top of fence posts that defined his farmyard. Adult members of the family would shake their heads at his creations but as a child I was fascinated. It took me 50 years to put a label on what Uncle Shorty was doing. 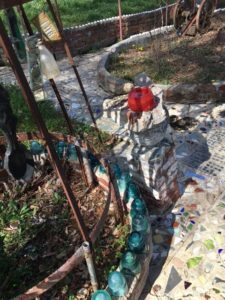 Many, many years later I was able to work with Judy Onofrio (a more intentional “outsider” artist) on a curriculum writing project using her found object mosaic sculptures. 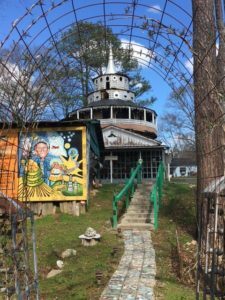 Along with writing curriculum for young students about outsider art, the writing team and I also drove through Wisconsin visiting outsider art sites. We had a ball! No wonder that in our travel this week to Florida we detoured and came to a screeching halt in out-of-the-way Summerville, Georgia. This is the location for Howard Finster’s “Paradise Garden.” What an amazing place! I guess what goes around comes around! This brings me around to Howard Finster, (December 2, 1916 – October 22, 2001). 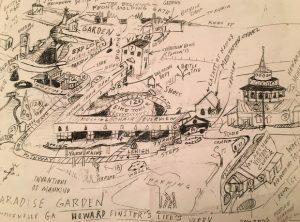 Howard was an American outsider artist and Baptist minister from Georgia. 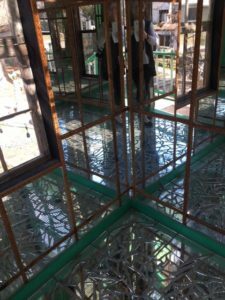 He created “Paradise Garden” on swampy land behind his house in the early 1960s. 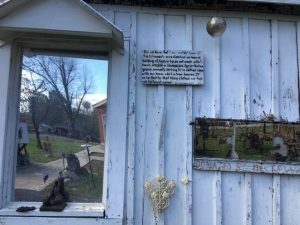 Composed of walkways and constructions made from cast-off pieces of technology, the Garden assembles individual monuments into an all-encompassing “Memorial to God.” Much of the building material in the garden was accumulated from Finster’s television and bicycle repair businesses and his twenty-one other trades. 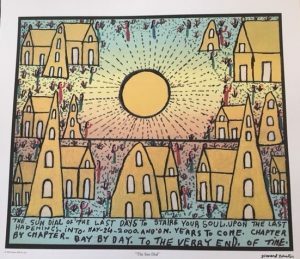 Finster began churning out thousands of sermon-laden artworks with subjects ranging from historical characters and popular culture icons like Elvis Presley to evangelistic fantasy landscapes and futuristic cities. Most works are meticulously over-laid in Finster’s own hand-lettered words and Biblical verse. To spread his vision to a wider audience, Finster designed record album covers for rock groups such as R.E.M. and Talking Heads, later earning him Record Album Cover of the year by Rolling Stone Magazine. Interviews, films, and his famous appearance on The Tonight Show with Johnny Carson further advanced his evangelical message. There is a lot on the internet about this amazing artist. I am so grateful the the body of work from this “Grandfather of Folk Art” is accessible and can be enjoyed by many. For over 25 years we lived in a home that we remember with fondness for the beautiful grape vine fence that defined one of the property lines of our yard. Although the grape vines belonged to our neighbors, this 8+ foot high wall was gladly attended to by both of us. In the spring, it always was announced when one of us first saw the vines begin to grow upwards to the first wire. We noted the new change of the vines as we noted the return of the robins. Those wires would later support the massive growth and extension. I remember watching with wonder as the vines, throughout early spring filled in and once again brought privacy to the yard. 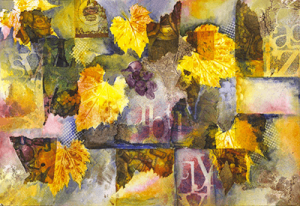 Later in the fall the vines would be abundant with grapes. I was reading a blog last week about creativity and the metaphor for vines was used to explain creativity. The writer David Naimji wrote about defining creativity through this metaphor. As I read, I remembered those grape vines. Grape vines send out tendrils as they grow. The tendrils are designed to wrap around something in the environment to give the plant support as it grows to maturity. The tendrils are like the plant’s divergent ideas. They shoot out in many directions and if one of these tendrils affixes itself to a post or wire in the fence it wraps tightly around that wire or post and grows more strongly from there. The tight curvy spiral of the tendril is amazing to “unwind.” Its natural inclination to stay in the tight corkscrew growth. Many tendrils go nowhere. If there is nothing for them to attach themselves to they eventually dry up. But they took a risk! Sometimes a tendril going nowhere one day will happen to latch on to something that wasn’t there the day before. Maybe they were just ahead of their time? When I find myself doing a “bird walk” with my ideas I have to remember that I am not sure about what this the tendril might represent. Yes, it could dry up and lead to know where, it could be the idea that leads to personal expression, or perhaps it is just a nugget of an idea that I will come back to at a later time. It may attach itself to another tendril and become even richer and deeper. We all need to remember to honor, support, and nurture those tendrils of creativity. Creativity seems to appear by magic but it really is about growth, risk taking, and a that deep well that supports growth. Source: David Naimji is a teacher at C.R. Marchant Middle School in York, Ontario. With Valentine’s Day right around the corner it seems that we all cannot escape the advertisements for flowers, candy and cards. We are all overtaken with the colors of pink and red and the oversized hearts hanging from the lighting fixtures as we fill our grocery carts, pick up something at the drugstore or Target. How can we not find the right card for all the right people in our lives? Shakespeare’s sonnets, along with Chaucer can be thanked for romanticizing Valentine’s Day. And when Hallmark Cards started mass publishing cards in 1913 the holiday was changed forever. How can we not find the right card for all the people in our lives? Valentine’s Day is about the heart. But maybe not the way Target perceives it to be with the symbol imprinted on coffee mugs, socks, or in the shape of a candy dish. 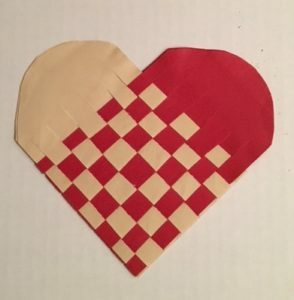 That is why I found Molly Vass’s quote so beautiful, it reminds us all about connecting and finding a common beat of heart, going beyond cards and candy. We all seek to connect to people and develop an understanding of others. A couple of weeks ago I went to the Como Park Conservatory to paint in the sunken garden. A number of adults and children stopped for a few minutes to ask about my sketchbook, the watercolor sketch I was doing, the tools I was using. For a brief moment we both found a common beat. I came to a realization that entering a room for an art class or workshop, talking to people when I sketch in public, or becoming part of an on-line drawing group are my petrie dishes for finding a common heartbeat. These opportunities are powerful ways of how art can draw hearts together. 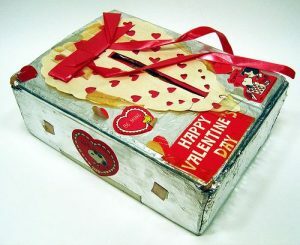 So following the tradition of my first valentine to my mom and dad, the handmade valentine’s box made in a long past elementary classroom, I will take out my card making materials this weekend. and create another way to connect with others on this holiday.